Created by the Rodgers’ Pudding company in Chesapeake, Virginia, Banana Pudding Lovers Month gives all of us an opportunity to pay tribute to the only pudding flavor that can give plain ol’ chocolate a run for its money. Besides being tasty and satisfying, banana pudding has a surprisingly rich history in this country — and enough fans to support an annual two-day National Banana Pudding Festival and Cook-Off. So as you ramp up to Thanksgiving, treat yourself throughout November to this delectable dish. Yes, it's a pudding festival! The first National Banana Pudding Festival was held in Centerville, Tennessee. It is a two-day event held the first weekend of October. Nabisco started printing a banana pudding recipe that includes the cookie on its Nilla Wafer box. Banana pudding became a U.S. dish as international trade networks make the once-exotic fruit affordable. Mary Harris Frazier published an early banana pudding recipe in her comprehensive Southern cookbook "The Kentucky Recipe Book"
Good Housekeeping magazine first published a banana pudding recipe, served over sponge cake. It's hard to beat an original, and the American South seems to have perfected banana pudding. Don't forget the Nilla Wafers or whipped cream, and make sure to serve it in a mason jar! Fry your bananas Indonesian-style before adding them to your pudding, add toffee to your pudding to make it British, or try substituting plantains and cinnamon into your recipe! Rev up your Google machine and start researching! There's a wealth of delicious recipes for making your banana pudding sugar-free, low-fat, low-carb, vegan, or paleo! Georgia band Southern Culture On the Skids used to throw banana pudding at their live audience during their suitably named song "Banana Puddin." In the Southern U.S., restaurants traditionally serve banana pudding in mason jars. Judges at the annual National Banana Pudding Cook-Off rate puddings based on use of basic ingredients, appetizing appearance, texture, color, aroma, taste, and ease of preparation. Influential Boston cooking teacher Mary J. Lincoln made banana pudding without pudding — just layers of sliced bananas sprinkled with sugar and lemon juice, baked and topped with meringue. Banana pudding can be chilled, baked or even molded. Creamy, moist, sweet and sometimes crunchy, a traditional banana pudding dish — one that includes Nilla Wafers and whipped cream or meringue — can satisfy in many ways. Like most puddings, banana pudding can be prepared and flavored in a surprisingly large number of ways, and it can be added to a bunch of other dessert dishes. 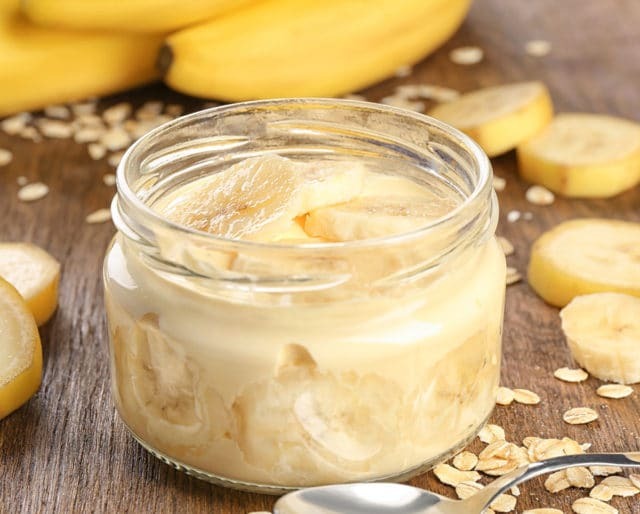 Banana pudding, despite the sugar, is rich in protein, potassium, magnesium, pectin, and fiber.